Born in Stuttgart in September 1900, and a talented pre-war singer with the fledgling Westdeutscher Rundfunk radio station in Kőln, Wilhelm Strienz just saw out the final months of the Great War as a cadet in the Kasier's navy, though at war's end he embarked on a commercial business career. However a family friend heard his talent for music and, introduced him to the the Director of the Stuttgart Conservatory who, fascinated by the young man's deep voice, encouraged him to have singing lessons. As early as 1923, he was making his first professional appearances as a singer and then work beckoned as a recording artiste, however his growing career was interrupted when the Third Reich dawned in 1933 and he was banned for two years from performing in Germany for refusing to join the Nazi Party. But weathering that awkward period of his life, he once again became a popular radio star in 1935 though it was eventually the world-famous Sunday night Armed Forces radio request show, the Wunschkonzert für die Wehrmacht that would bring his talent to an international audience and establish one song at the heart of this famous show! 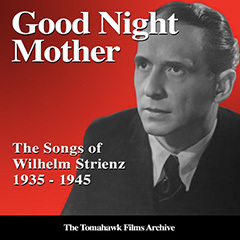 As a sad hush descended on the radio station, Wilhlem Strienz exclaimed .“I know that song” and as programme compere Heinz Goedecke narrated her story to the massive audience listening in, adding: “Walter has died not just for you, but for everyone”… Wilhelm started to sing and his movingrendition of ‘Gute Nacht Mutter’ filled the speaker.... and a German radio legend was born!